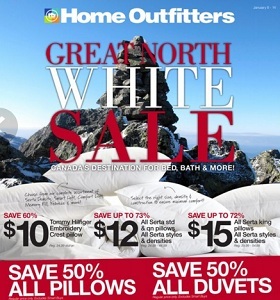 Home Outfitters is Canada’s largest kitchen, bed, and bath superstore selling bedding, towels, housewares, and other home accessories. 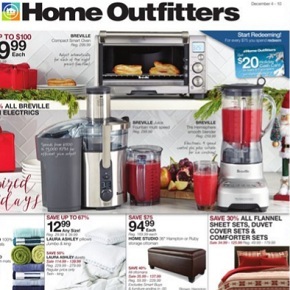 Home Outfitters sells products from major brands including GlucksteinHome, Steven & Chris, Vera Wang, Cuisinart, Simplehuman, Dyson, and KitchenAid. 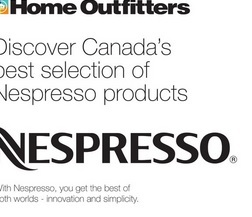 Home Outfitters, known as Déco Découverte in Quebec has over 60 stores across Canada in Alberta (Calgary, Edmonton, Spruce Grove), British Columbia (Victoria, Burnaby, New Westminster, Coquitlam, Richmond, Abbotsford (Closing), Port Coquitlam, Langley, Kelowna, Nanaimo), Manitoba (Winnipeg), Nova Scotia (Halifax), Ontario (North York, Etobicoke, Vaughan, Concord, Scarborough, Kanata, Orleans, Mississauga, Gloucester, Ottawa, Thunder Bay, Guelph), Quebec (Quebec City, Montreal), Saskatchewan (Saskatoon, Regina). 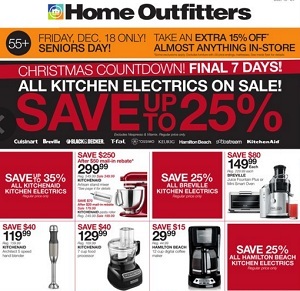 This week Home Outfitters flyer online. 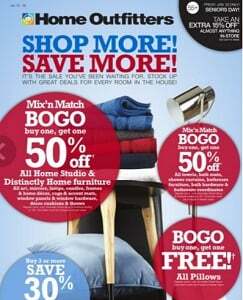 Best Home Outfitters weekly flyer, specials, sales, coupons, deals and offers in a single place.